This has been out since late September, so I apologize for the late posting. Food & Drink: Five contenders sat in different corners of the UC, picked asunknowing finalists in New Heights' mission to discover whose Chinese Take-Out reigns supreme. And the winner is ??? Arts & Events: Hillsborough High & Seminole Heights Documentaries (Oct. 4); Tampa Bay International Auto Show; TBPAC's 2008-2009 Bestof Broadway Season; Cigars & Stars IV; and more! News & Rumors: Is it Real or Rumor? From the Newsline to the Grapevine, New Heights goes myth-busting to bring you the latest scoop! 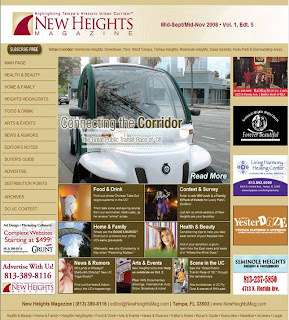 This issue: New Heights Lands a Whaleys (almost); Starbuck's Closing; Five Guys Burgers and Thai; and more! Join Us for a Celebration as New Heights turns 1!